Happy Tuesday! I am starting a new series for the blog today all about Tips you can use to help make your life in the kitchen a little easier. I love learning tips and tricks when it comes to food and cooking. I have learned almost all these tips from family, friends and TV so I thought it would be fun to pass them onto you. Some of these tips maybe ones you are familiar with already... hopefully some will be new and you will enjoy using them. Today's tip is a very simple one, but it works great. My daughter likes sliced apples in her lunch box almost every day. Now everyone knows that a cut apple will oxidize and turn a very ugly brown color. It's certainly a terribly unappetizing look for a delicious apple. Now there are several methods I have seen out there to keep apples from turning brown. Companies even sell special products at the store to solve this problem. I used to put lemon juice on apples to keep the cut slices from browning, but my daughter did not like the "sour" lemon flavor it gave to the apples. Plus I don't always have lemons at home or want to use my lemons just for this purpose. 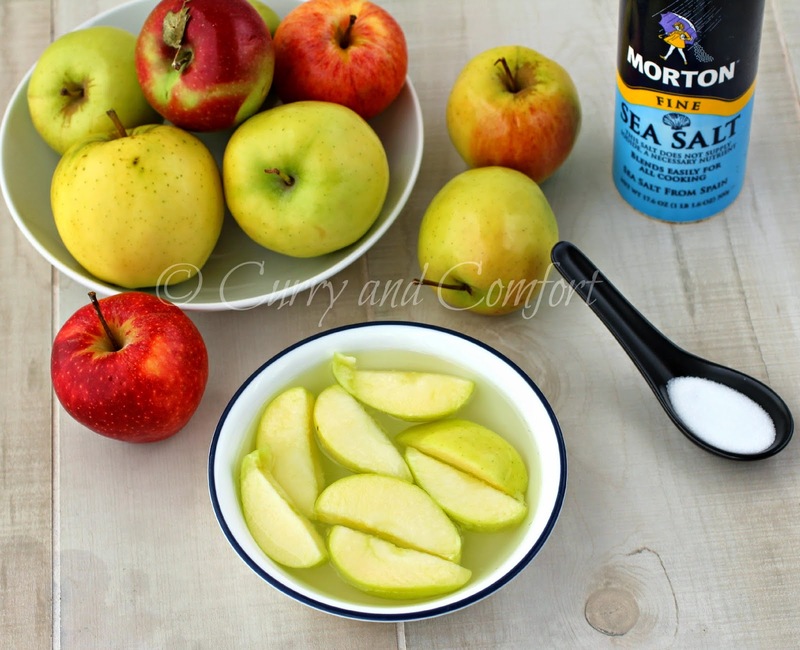 Here is another way to keep those apples from browning by using salt. Salt is something that is really inexpensive and something I always have plenty of in my house. So there is no need to run to the store for any special product or lemons... salt is all I need. I simply put a half a teaspoon of salt in a bowl with some water and place the sliced apples for several minutes. They don't brown and keep fresh all day and even longer. The salt does not over power the flavor of the apple and the hint of salt even brings out that the tartness in our favorite Granny Smith and Golden Delicious apples. I hope this easy tip today was useful. Look for more kitchen tips to come your way next Tuesday. Place all ingredients in bowl and allow apples to sit for 2-3 minutes. Place soaked apples on a paper towel to dry then enjoy immediately or use in recipes or as a snack. I've tried using lemon and the salt method to keep apples from browning, however, I found neither method works. Do you use the salt or lemon method the night before or on the day of? The reason I ask is because I cut up my apples the night before and put lemon/salt on it. I'm wondering if it's supposed to be done the day you plan to eat the apples. I only soak the apples for a few minutes the day I cut and serve them. I always thought lemon juice was the key to this problem. One of my biggest food annoyances. No one likes a brown apple. I've tried this today and works perfect. Kudos for sharing the tip.